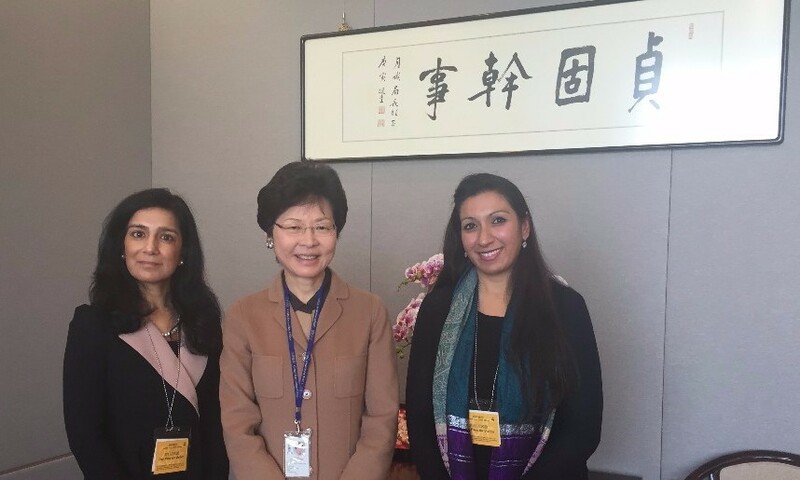 In a meeting on Thursday, 17 December 2015, CCPL Director Puja Kapai presented the key findings from her recently compiled Report, “The Status of Ethnic Minorities in Hong Kong 1997 – 2014” to Mrs Carrie Lam, the Chief Secretary of the Hong Kong SAR. The Report, published in September 2015, was commissioned by Shalini Mahtani, Founder of The Zubin Foundation (TZF), an NGO working on issues relating to ethnic minorities and non-Chinese speaking special education needs children in Hong Kong. Based on the research, Kapai and Mahtani co-presented four core recommendations for the Administration’s consideration to work towards improving the lives of ethnic minorities and more importantly, including the voices of ethnic minorities in decision making. The four recommendations are also separately being presented to the Chief Executive's office for consideration in the preparation of the Chief Executive 2016 Policy Address. A statement to be made by Chief Executive, CY Leung in his Policy Address for 2016 to express that all Hong Kong people, regardless of ethnicity, are equally valued. To that end, the Administration ought to develop a policy for an inclusive/multicultural Hong Kong. All policies and law to be developed ought to have a “diversity lens” applied to them to ensure that they are also considered from the viewpoint of and assessed for their impact on ethnic minorities in Hong Kong. For government committees, extra effort ought to be made to ensure that for all positions to be filled, ethnic minority candidates are included in the list of potential candidates to be considered (as the government would do for women as part of its gender mainstreaming policy). To this end, the Zubin Foundation will launch the RACE FOR OPPORTUNITY: DIVERSITY LIST on 21 March 2016, which is a list of ethnic minority candidates who have the skills, capability and commitment to serve on government committees. Government to provide greater transparency by school (public and private) on types of support they provide and the severity of NCS SEN that they cater for. English Medium of Instruction (EMI) classrooms/streams be established for public sector special schools and Chinese Medium of Instruction (CMI) schools. Direct Subsidy Scheme (DSS) schools, private schools and international schools be approached to commit to accepting NCS SEN and providing appropriate support. Government to increase subsidies for SEN students in government schools (e.g. Macau provides 40,000-110,000 MOP per year per student to school compared with Hong Kong, which provides HK$13,000-26,000 per year per student). The subsidies ought to be extended to be made available to NCS SEN students who are not in government schools. Government to build another EMI special school given the critical shortage of available spaces for SEN NCS. To download "The Status of Ethnic Minorities in Hong Kong 1997-2014 Report" in full, please click here.